Sheldon Rowan, a scientist in the Nutrition and Vision Research Laboratory at the Jean Mayer USDA Human Nutrition Research Center on Aging at Tufts, serves as our expert. Q: Can what you eat change your gut microbiome? A: Absolutely! Almost everything we eat has some effect on our gut microbiomes. There’s good reason to be aware of that: We know from a dizzying number of studies that a diverse, well-balanced microbiome is associated with health benefits, such as improved glucose tolerance, better immune function, or better weight control. On the flip side, a poorly functioning gut microbiome, known as dysbiosis, can contribute to Crohn’s disease, C. difficile colitis, and even autoimmune diseases. Increasing dietary fiber and eating diverse fruits and vegetables is a sure-fire way to positively impact our gut microbiomes. And although one might guess that probiotics would have a huge impact, research has shown only minor effects without clear health consequences. Large-scale changes in our dietary patterns lead to large changes. Volunteers fed diets containing only plant-based foods had very different gut microbiomes from those fed only animal-based foods. One brave lifelong vegetarian ate the animal-based diet and had the most dramatic changes. Our microbiomes do show some durability, though, as that volunteer’s gut flora later returned to baseline. Meanwhile, smaller dietary changes led to less dramatic changes. In one study, volunteers were fed either processed white bread or whole-wheat sourdough. Although the whole-wheat group showed health-metric improvements, the microbiome did not change significantly in either group. In addition to pointing to the need for larger changes in our dietary patterns, these findings suggest there is no single magic food. Or is there? 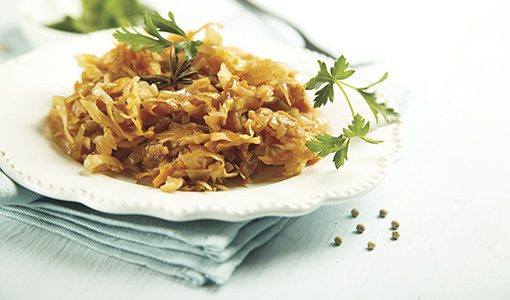 One group of foods generating tremendous research interest are fermented foods like sauerkraut, kefir, kimchi, and kombucha. Studies show that these foods can change our gut microbiomes more dramatically than any probiotic or even prebiotic. Fermented foods have been eaten by people going back millennia, suggesting that our ancestors were just as interested in enhancing their gut microbiomes as we are today. Send your questions for “Ask Tufts Nutrition” to Julie Flaherty, Tufts University Office of Publications, 80 George Street, Medford, MA 02155 or email julie.flaherty@tufts.edu.